Joy Division frontman Ian Curtis remains one of the most enigmatic figures of rock. The band’s songs were a reflection of Manchester in the late seventies and a foil for Ian Curtis’ troubled personality, as he battled depression, epilepsy and debilitating stage fright. Curtis committed suicide in 1980, on the eve of the band’s first American tour. 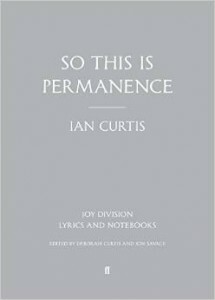 “So This is Permanence” is a collection of three of Curtis’ notebooks, containing lyrics, some prose and notes. They give an idea of his approach and underscore the heavy longing that was a trademark of much of his writing. Jon Savage, who edited the book, says that there are few revelations as such. The prose writing, however, indicated Curtis’ taste for dystopian science fiction. Interspersed with the lyrics are previously unpublished facsimile pages of Ian’s notebooks, which throw his highly emotive lyrics into fascinating relief and cast light on the creative process of this singularly poetic songwriter. “So This is Permanence” is published by Faber & Faber.